So, I’ve been recently considering building a darknet machine with spare parts I have sitting around. I’ve come to realize that the plethora of media I have is so large, and normal P2P channels so inherently dangerous, that a subversive way to share it all with friends and family is really the way of the future. What if each of us puts together a mighty collection, a massive underground library, and then we all link up and share all that information. That would be beneficial to everyone. The real question is how. There’s always the old alternatives. Direct Connect has been around for years and you can still find DC hub and client software. That would probably offer the least overhead. We’d simply need a machine to be left on as a hub and then each person could connect at their leisure. An old school WASTE network is another possibility, but that would involve sharing public keys to gain access, which is tiresome. A small Hamachi (or Hamachi2) network would operate in a similar fashion, as would an OpenVPN. In those instances however, the user would all need client software and would have to add predetermined “friends” or friendly IP addresses. Freenet would offer a step up from that in terms of content management since we’d be creating our own mini-internet. Beyond that we’re talking about setting up home web and FTP servers. That might be a little more complicated (especially if I’m doing it) than I’m willing to get. This is actually something I’d like to do. I have a perfectly usable AMD Athlon generation PC sitting under my desk at home not doing anything and a 20mbps fiber connection at the house. The trick would be finding huge IDE hard drives. Or, finding the money to upgrade to SATA. Originally I had wanted to use the box as a HTPC, but given that I don’t have anything worth streaming to my TV and that my TV tuner card died, that seems like more of a hassle than it’s worth. Anyone have any ideas as far as setting up a network would be concerned? Anyone even interested in sharing their music/game/tv show collections? Thoughts? Well, we’re back after our long and restful vacation to Savannah. We mostly went back for ourselves, just to see what had changed in seven years, but we were able to meet up with some good friends and have a great time while we were at it. We started driving early last Saturday morning. With the wife being pregnant, and at the doctors recommendation, we stopped every hour or two for a stretch. That left us with plenty of time, but a two day drive. We decided to have some fun with it and stop at each state line for cheesy tourist pictures. I’ll spare you from seeing those. 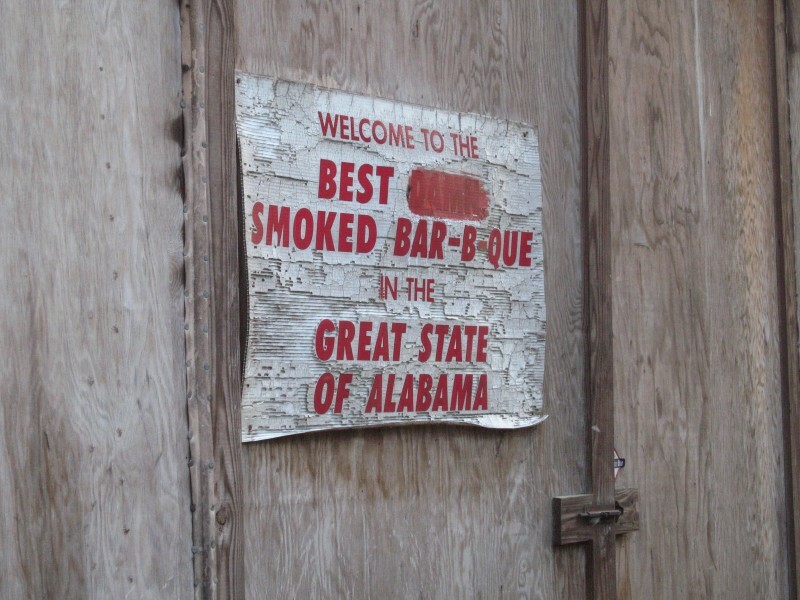 Our half way point was Mobile, AL, which isn’t really half way but does have something worth stopping for. 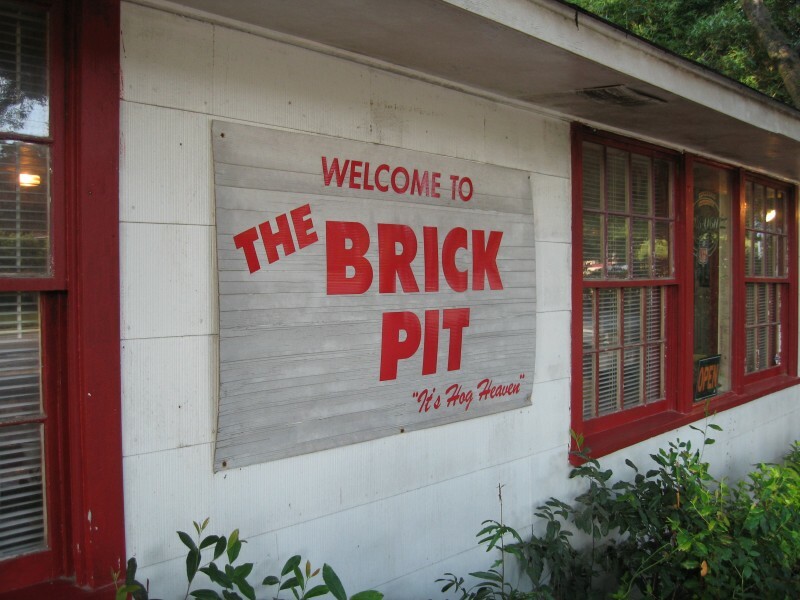 The Brick Pit BBQ is located in Mobile and is on my (and others) lists of “Holy Grails of BBQ”. It’s a simple shack along side a back road in Mobile, about 20 minutes out of the way of anything in perticular. The sign on the road reads “This is the real deal. 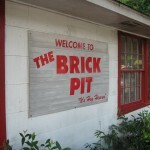 The Brick Pit, the best damn barbecue in the great state of Alabama”. That pretty much sums it up. The dining room is large enough for about 12 tables. You order through a small window at the back by the kitchen. 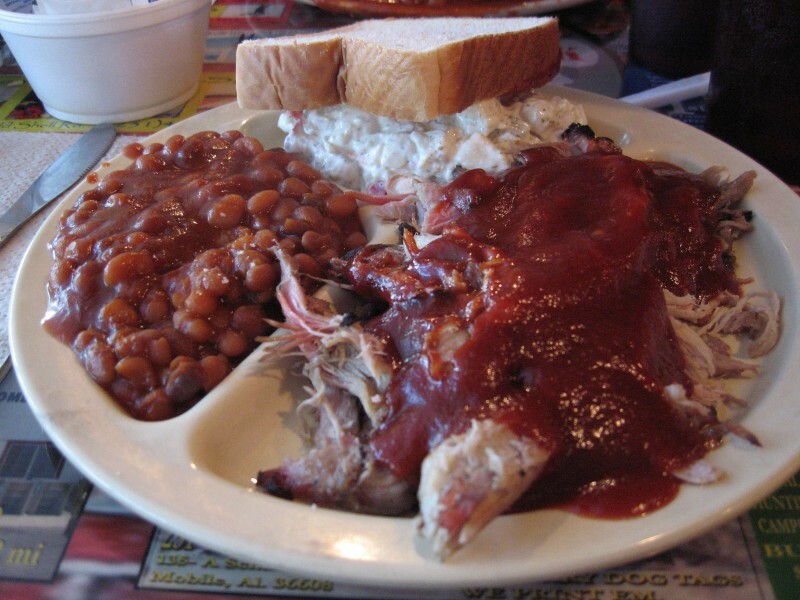 Our first stop was all about the ribs. Perfect, succulent, fall off the bone pork spareribs. They were legendary. It was so good that we vowed to stop again on our way back in a week. 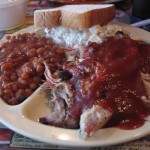 We did, the 2nd time opting for the pulled pork. It simply dissolved in your mouth, it was even better than the ribs. Fueled by tasty pork products the next day we hit the road by 5am and finished our drive into Savannah around 4pm. Just in time to check into the hotel. We found a great deal on staying at The Mansion at Forsyth. A cool boutique hotel, our room was huge and had a great view of the park. It had a massive soaking tub which Lauren enjoyed and one of those “rainfall” showers that I liked. As soon as we had dropped off our bags and changed we made a B-line strait to the historic district for some Pizza. We had always loved Vinny Van Go-go’s pizza while we were in school and it was still alive and kicking. We were able to meet up with two of Lauren’s old roommates, Brittney and Hallie and my old roommate Jason. It was awesome getting to catch up with everyone. The next couple days we did the tourist thing as a group and met up with everybody for dinners and lunches. We went to our favorite Italian place where Lauren and I had dozens and dozens of dates. We visited all our old favorite SCAD buildings, various shops downtown, the school bookstore and most importantly, our old coffee shop, Gallery Espresso. It was great to all at once be excited to be back and at the same time, be in such familiar surroundings that it felt like we had just left. The SCAD kids hadn’t started classes yet, so we pretty much had the run of the town without huge crowds, which was nice. We even got in at Mrs Wilks, a crazy little B&B that serves the best lunch in the city. Tuesday night we all headed out to the bar above our hotel for a little more catching up. I introduced Jason to Scotch and Lauren and the girls had milk and cake. We talked and caught up for hours and I had a great time talking shop with Jason. I really missed being able to have real artistic conversations with people and Jason and I are on the same wavelength on a lot of things so it was great to catch up. We even swapped some music by the end of the week and now I’m working my way through the great stuff he gave me to listen to (Teenage Bottlerocket is epic btw). Friday we had to say goodbye once again to the city where my wife and I fell in love, where we met our best friends, and where we spent four years doing more crazy artsy things than I have in all my other years combined. We packed up early in the morning and hit the road, stopping for breakfast along i95 before turning westward onto the i10 corridor. 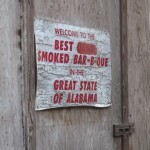 Thankfully traffic was light and we made good time back to Mobile where, as I mentioned before, we stopped once again for some BBQ. Saturday was more leasurely. We knew it was the shorter of the two sections so we were able to take our time. We stopped once again at each state line, getting photos at the ones we had missed the first time. Around lunch time we were in the middle of the Louisiana swamp. Stopping at a rest area, we asked some locals where we could find something to eat. The first things they mentioned were all generic and chain restaurants a couple exits away. We asked them for some more local flavor instead. It had turned into quite a “road food” trip. We were led to the Boudin Store, which from all outward appearances was just a convenience store (complete with gas pumps). Inside however, was a really nice guy with a thick cajun accent wanting to know what we’d like to eat. Lauren got the fried chicken and I opted for the shrimp and crawfish. Both were awesome. Just goes to show that there are some great experiences to be had at small local holes-in-the-wall. Saturday night we pulled into the driveway finishing what was a truly great roadtrip. We had so much fun in Savannah and it was great to see everyone and catch up. It was a long drive, but totally worth it.